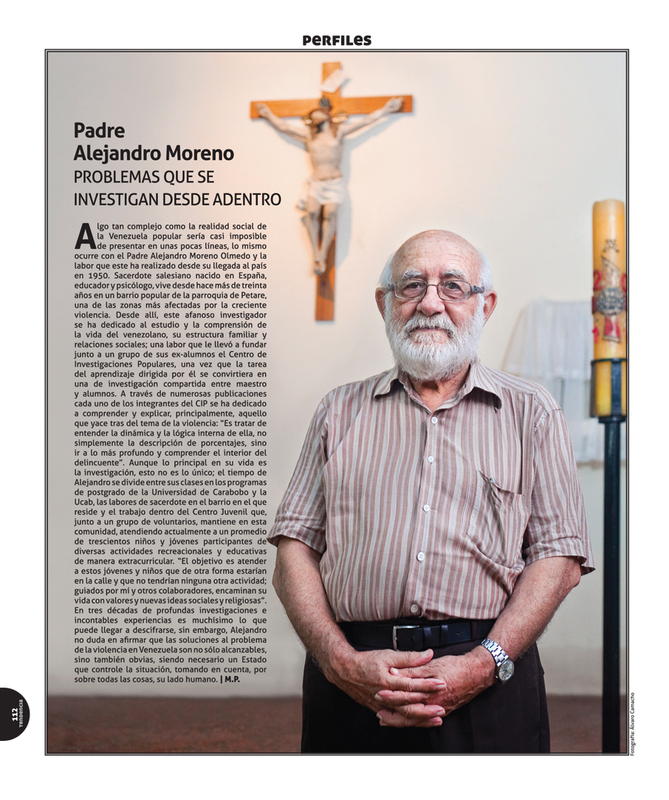 Over the last few years, Father Alejandro Moreno has established himself as an authority on the topic of Venezuela’s crime epidemic. For years, he has toiled in Venezuela’s toughest neighborhoods. This has given him an insider’s look at what makes these criminals tick. This interview of the father by the Venezuelan news outlet Contrapunto is astonishing. Moreno terrifies us by providing his assessment of the crime wave: its root causes in the failure of the State; its link to the family structures in our barrios; and the role that political discourse plays. … We can now say that the criminal life of many of these offenders begins at 12. … The adolescent frees himself from guilt fairly quickly. According to our experience, after the first murder he doesn’t sleep that night, perhaps. But after 24 hours, indifference sets in with regards to what he has done, and this will stay unless the young person has accumulated a certain level of ethical experience, unless he has a family that has given him positive experiences. … These are not organized gangs, really; sometimes they are just “panas” (buddies), which is something very Venezuelan, the affectionate “you-and-me.” These groups are unstable – they lose some, they gain some, there are inner quarrels, and they kill each other off. … As they relate to each other and weave organizations, these groups become something like a parallel State. An effective State. … The older offenders, I mean those between 18 and 20 years of age, are the most succesful: they have their “jevas” (girlfriends), motorcycles, parties, prestige and respect. Some of them even have good relationships with the police. … We have seen researchers ask in schools: what do you want to be when you grow up? A good percentage of the kids answer: I want to be a “malandro” (thug). … The mother is frequently complicit with the son in order not to lose him. She is alone, and there is no father figure at home. She can fight him, give him advice, but if he comes home with something stolen, she helps him hide it. It is an ambiguous relationship.